This throttle ball assortment helps to replace worn throttle studs and includes 4 throttle balls with various threads. 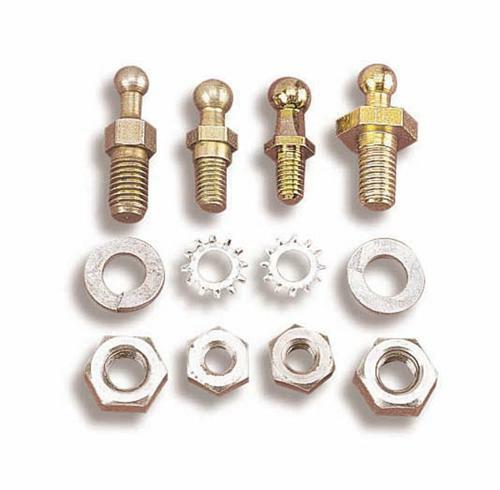 This throttle ball assortment helps to replace worn throttle studs and includes 4 throttle balls with various threads to allow the flexability of the throttle cable of your choice. Each kit contains 1/4", 5/16", 7/32", and 3/8" stud adapters. Holley, The Heart & Soul of Performance. For over 100 years Holley has been proven to be an industry leader by providing Mustang enthusiasts and racers with the high performance carburetors , intake manifolds, cylinder heads, and other quality performance components needed for today's competition. Holley's performance Mustang parts are perfect for any daily driven or high horsepower race car.